Delicious sugar cookies cut in a house shape and printed with your custom image. Iced and dipped in sprinkles. Shelf-life is 4-6 weeks when unopened and stored properly. 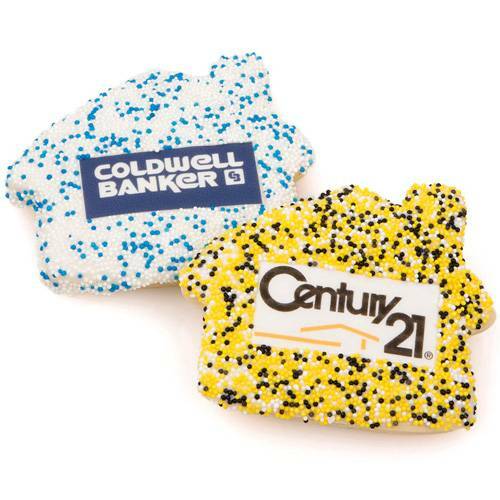 Our house-shaped custom cookies are hand dipped in smooth icing and imprinted with your company’s logo. A perfectly unique promotional gift for real estate agents, home buyers, home repair businesses and more. Each cookie is finished with a generous coating of sprinkles in the color of your choice and then individually wrapped for freshness. Need to send to multiple locations across the country? Just fill out the Request Estimate form above by clicking the tab next to Order Now. We can coordinate large orders - years of experience with our corporate clients have led us to develop a painless drop shipping process that minimizes the time you have to spend and maximizes the impact of your gift. Talk to us today to get started with your next successful marketing campaign or corporate gifting campaign. Unlike other promotional gifts, logo cookies can be 100% branded to your business from the image printed on the cookie to the sprinkles. We can include literature or other special materials as needed.